You may need to depressurize the fuel system on your DB9 if you are going to do any work with the fuel rails or fuel injectors under the hood. I am doing this as part of changing my coil packs and spark plugs, but you might be wanting to change a fuel injector or various other engine service tasks. Normally the fuel system has ~40psi of fuel pressure (even when turned off as residual pressure), and if you are going to disconnect something with the fuel system under the hood (bonnet), you don’t want the risk of it spraying you, your car, or worst of all causing a fire. Depressurizing it is fairly simple. We are going to run the engine out of gas by removing a relay that operates the fuel pumps. No fuel = no pressure. Easy. This particular part of the process requires only your fingers, but in two of the referenced sections you’ll need tools to access the cabin fuse box and an OBDII code reader to reset the P codes this process will potentially generate (see the links to those posts below). The process is fairly simple and will only take you about 10 minutes. 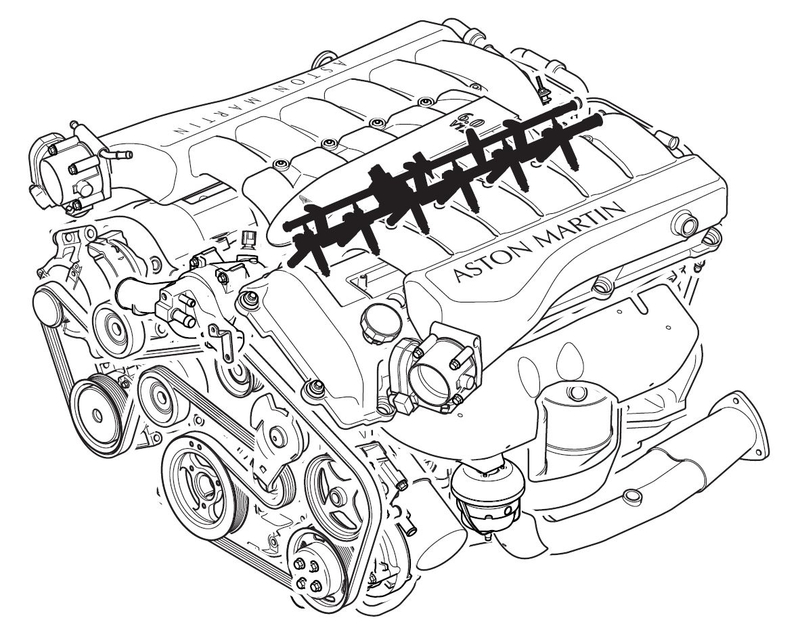 The official Aston Martin Workshop manual section 3.04 on the Fuel Charging System covers this, but the diagram shown for the relay is just wrong, so see my procedure below. Make sure your car is in the final position you want it in before you start this process. Remember, we are going to run the engine out of fuel, so you wont be able to drive it around in your garage anymore (unless you are willing to do this procedure over again). You need to access the cabin fuse box. Here is my post and video on how to do that. With access to the fuses and relays, we will be removing Relay R15 which is the Fuel Pump Relay. By removing it, the fuel pumps will be de-energized. 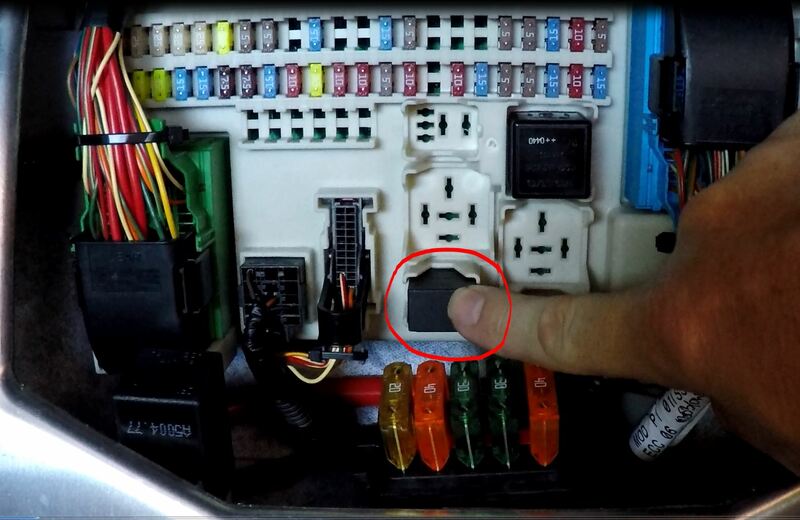 Remove Relay R15 by grabbing it with your fingers and pulling it straight out of the socket. It took some effort for me to get mine out, but it did just pull out. No catches or releases. See the video below to see how. Start the car. Be mentally prepared for the weirdness that follows. Within about ~11 seconds the engine will begin to run like crap, lumpy and then die. This is it running out of fuel, exactly what we wanted. It will just turn off. Reinsert the R15 fuel pump relay. Just push it in gently at first to make sure the electrical contacts are all lining up, then push it in firmly. Close up the Cabin Fuse Box now that you are done with it. NOTE – From this point on you should NOT turn your key on again until you are done your service work. If you do, the fuel system will pump the pressure up again. It does this BEFORE the engine start button is pressed (getting ready as soon as you turn the key). I made this mistake. If you need to be able to turn the key on and keep the fuel system depressurized, keep Relay R15 removed until you are done, and then put it back when you are ready to have fuel pressure again. off line’). You can erase these codes from each bank after your work is complete. Connect your OBDII code reader to review the codes and clear them as appropriate. Seem by blog and video on how to do this. Overall this is a fairly simple safety step to take prior to working on your fuel system. Inevitably someone might ask for details about the actual relay in case they are needing to replace it. The fuse in my car was made by Volvo (yes another shared parts bin item from Ford at the time of the DB9’s design – Ford owned Aston Martin and Volvo at that time). A little Googling on that Volvo part number reveals that it was originally developed as the Fog Lamp Relay on a Volvo S60, but I guess the Aston design guys felt it was ideal for this use too. 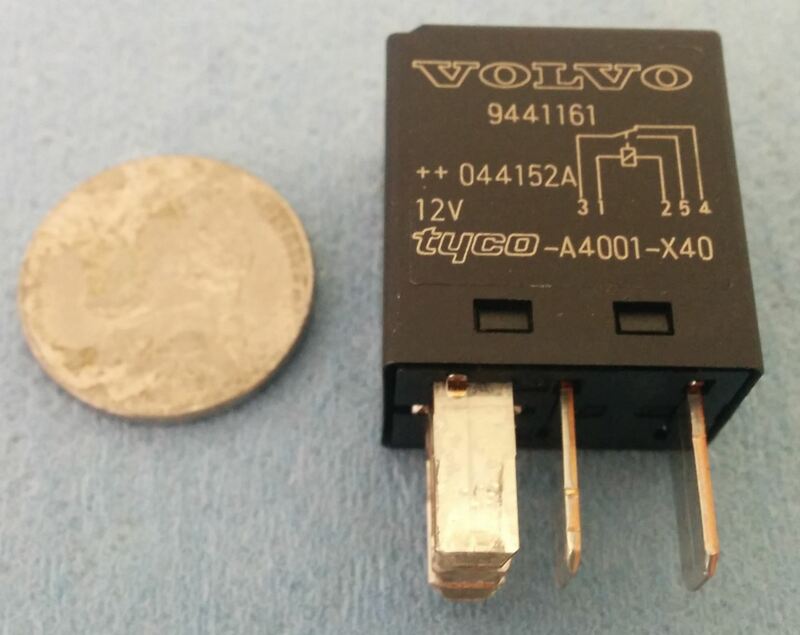 That original Volvo OEM part number appears to be no longer available, but if you Google it, you’ll find LOTs of current equivalents, including this $9 USD version available on Amazon.com. Here is a photo series of it from all sides. Hi Steve, thanks for another great blog, I have 2 questions? 1- The 2 fault codes which are generated, will they go away once the system is recharged and healthy? I don’t have the OBDII reader to reset any codes. 2- I’ve read in the DB9 workshop manual that you need to disconnect the battery within 10 seconds of switching off the ignition to prevent the alarm going off? So basically you need to remove the relay, run the engine until it stops, switch off, then remove the back seat to gain access to the battery, then switch on the ignition, then off, then within 10 seconds disconnect the battery, then put the fuel relay back in? Great observation Paul. Regarding the faults, I don’t believe they clear automatically, but they may not trigger the MIL. Probably not the end of the world not to clear them, but likely a task to accomplish sometime. Regarding the battery disconnect, good question. I did the battery disconnect probably an hour after my fuel depressurize, and never even considered the alarm issue. I am writing that section up next, so I will look into it. Hi Steve, as I have a slight ‘misfire’ or ‘fuel’ problem, I spoke to Aston Martin Dealer and was advised there are TWO (2) fuel pump relays, one for each bank and so ordered both to be sent to me in Spain as the cheapest option before replacing coils. They charged me £3.00 each (inc. VAT) for them so the postal cost to Spain was more expensive, total cost £14.49…! They are going to send me images of BOTH of the locations, so when they arrive I will upload them to this thread. Now my DB9 is a UK RHD 2005 Model so it may have changed on later models. They have advised they will charge around £2,500 inc. VAT to change all 12 Coils/Spark Plugs, Upper and Lower Injector Seals and both DPV and new Gaskets if it is not the fuel feed and a Coil Issue, which to be honest, does not seem that expensive when you consider the cost of all the parts. I’ll be interested to learn about the two fuel pump relays, there was definitely only one in my car. There are 2 fuel pumps, but controlled from the single relay. The costs to make the changes seem reasonable considering all the labor. Labor is supposed to be about 5.5 hours for a trained master technician. I spent about $1K USD in parts, plus spread the work over 3 days of a long weekend. Let me know what you learn! If you look on my ‘links’ page you’ll see a link to Porterfield Brake Pads. Use the link, put in the MY of your DB9, and select the Porterfield brand. The RS-4 pads should appear. I used these on mine last brake service. I think I paid $400 USD total, and they work very well. They have the slot for the wear sensor. Another owner recommended these to me since they generate much less brake dust. The link for the sensor is the same as the one for the pad. Cut/Paste error? Share if you can. If you are on that page, got to the bottom and you will see the leads, it then allows you to buy them as a set with the pads.